In spite of all the good things happening in the U.S. today, many are just seeing the turmoil. Everywhere we look there is some kind of crisis and some kind of conflict. Many people I talk with feel that life is hopeless. They believe we’ll never solve the drug crisis, the immigration crisis, the education crisis, or the global warming crisis. The list goes on, depending upon which issue or combination of issues worries them most. For some, this lack of hope is debilitating. They can’t move forward and find joy because they don’t think it’s possible. Are you feeling this way? Are you edging more in that direction every time you turn on the news, pay your bills, or have yet another conflict with a family member? If so, those feelings are blocking your ability to enjoy life, and it’s time to get your energies back in balance. 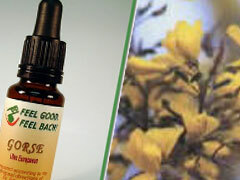 Dr. Bach’s Gorse flower essence can help. Gorse insulates us from negative thoughts and gives us strength, confidence, and positive feelings of hope. With Gorse as your helpmate, you can once again look forward to life and best of all, take positive steps to make good things happen in your life. You’ll see that yes, there is a reason to make the effort, because a positive outcome is possible. Don’t let despair drain the life from your life. Visit FeelBach! today and get back on the path to happiness.